Indonesian authorities continue to deprive the people of West Papua of their basic right to freedom of expression and assembly, as 49 West Papuan protesters were arrested on Monday. There has been a systemic crackdown on this right, with two French journalists remaining in detention for reporting in West Papua. The arrests on Monday [13 October 2014] of 49 Papuan protesters represent a deterioration of freedom of expression, Jakarta-based human rights watchdog Indonesian Human Rights Monitor (Imparsial) said today. “Freedom of expression in Papua is the worst in Indonesia. There’s a distinction between Papua and other regions in this country. 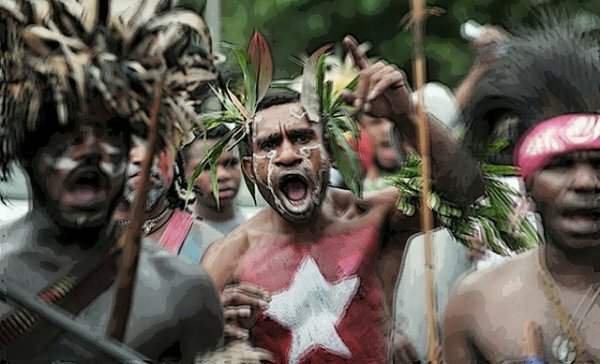 It can be seen particularly when the West Papua National Committee (KNPB) stages rallies,” executive director Poengky Indarti told ucanews.com on Wednesday. Dozens of KNPB members were arrested Monday while staging peaceful rallies in front of immigration offices in Jayapura and Merauke. They were released after nine hours of detention. The demonstrations were held to urge local authorities to release two French journalists arrested in August , along with three members of the Free Papua Movement. Journalists Thomas Dandois and Valentine Bourrat, who were detained while filming a documentary for Franco-German television channel Arte, stand accused of breaking Indonesia's immigration laws because they were working on tourist visas instead of media visas. Indarti called both the journalists' arrests and charges spurious. “If the journalists only violated immigration rules, just deport them. Why should they bother [with an investigation]?” said Indarti. Indonesia is known to be overly sensitive about journalists covering issues in Papua, where a low-level insurgency against the central government has simmered for decades. The government rarely grants visas for foreigners to report independently in the region. By branding all Papuans as would-be separatists, Indarti said the government has eroded basic freedoms of expression. “If the local government can’t change their mindset, the situation won’t change,” she said. Basoko Logo, spokesman of KNPB and one of the 49 detained protesters, urged the authorities to loosen its restrictions in Papua and West Papua provinces. Father John Djonga, an activist priest, acknowledged that in the past some KNPB protests had lead to violence. “Still, the KNPB members must not be suppressed at all times,” he said. The arrests “violate human rights,” the priest added. Police sources could not be reached for comment.